Steve Rubel, Director of Insights for Edelman Digital and well-known Lifestreamer interviewed Abbey Klaassen, digital editor at Adage over breakfast. Not sure what they ate but the conversation was short and sweet. Never heard of a Lifestream? Check out Steve’s here. As the Tate Modern in London celebrates the centenary of this dramatic art movement with a ground-breaking exhibition, it is interesting to look at the digital life we live today and see if the Futurists’ vision was accurate. On the Tate Modern site they tell us that “Futurism was launched by the Italian poet Filippo Tommaso Marinetti in 1909 with the publication of the Manifesto of Futurism on the front page of Paris newspaper Le Figaro. Drawing upon elements of Divisionism and Cubism, the Futurists created a new style that broke with old traditions and expressed the dynamism, energy and movement of their modern life”. Many of the pieces feature will be familiar to most art lovers. I’m thinking of Boccioni’s dynamic bronze Unique Forms of Continuity in Space 1913 and Picasso’s Head of a Woman (Fernande) 1909. When did our new Futurism begin? Was it with the first PC or the birth of the Internet? In many ways the Internet enables the Futurist manifesto which called people to ‘Turn aside the canals to flood the museums!… Take up your pickaxes, your axes and hammers and wreck, wreck the venerable cities, pitilessly!’ The digital medium, in the hands of the masses, allows us to attack the establishment – even famous brands are not immune from the merciless voice of the man in the street. Something that today’s marketers have to cope with when campaigns backfire. The recent Habitat+Twitter fail sale is a perfect example. With the Futurists speed was ‘the new beauty’, defining modern life, transforming even the structure of the human body. With the Internet data is the new beauty and can be expressed in amazing ways. Data visualization can result in incredible images that would have thrilled the Futurists. Expressing the intangible in a visual way was often their goal. Many of the artists in the exhibition sought new ways to shape their art. They drew upon new ideas of perception, experimental photography and multi-sensory responses… something that the digital medium makes possible more than ever before. Imagine showing the Futurists a touch screen wall display? Or augmented reality on a mobile phone? Painting and sculpture were not the only ways in which the Futurists expressed their ideas, they also held “disruptive performance”. As the Tate website says, “Night life had been transformed by electrification into a fashionable spectacle, the scene of new dances and flirtations”. In his 1913 Variety Theatre manifesto Marinetti exalted it as an art-form of his time, ‘born, as we are, from electricity’ and ‘lucky in having no tradition, no masters, no dogma’. It was a theme that engaged with the excitements of pleasure and its release from inhibitions, but also with constant movement and multi-sensory experience. Looking at artists like Bjork we see this Futurist dream brought to life. Especially with experimental instruments such as the ReacTable Table Synth. The Tate site goes on to say “Fast trains and telegraph wires – the improved communications that so thrilled the Futurists – meant that avant-garde artists working in Russia were extremely well-informed about activities in the West. The internet has taken this to extremes with people collaborating without ever meeting. One artist or musician shares something online and within hours it is mashed up, remixed or parodied. Futurism 2.0? War was an inspiration to the Futurists. They tried to capture the voracious destruction of the First World War in paintings in an attempt to ‘try to live the war pictorially’. With the technology available today war has become fuel for outpourings of expression through Twitter as well as live images coming from the scene of the action. Artists use technology to create animations expressing the injustice of war which circle the globe becoming weapons for peace. The industrial world the Futurists celebrated has become the commonplace. Even more recent Futurists such as Kraftwerk have seen their predictions come true. In a 1981 interview Ralf Hutter, talking about their latest album Computer World, said that before long electronic music would be everywhere. What must he think of the barrage of electronic music coming from mobile ringtones, iPods, computer games…? Technology still excites the masses yet in some ways enslaves us. Crackberry addiction, queues for the latest iPhone… Let’s admit it – we’re all Futurists now. FUTURISM at the Tate Modern lasts until September 20. Getting back to the original inspiration for this blog, the David Ogilvy book Confessions of an Advertising Man, the next chapter I should really cover is “How to get clients”. I saw an interesting example of attracting clients when I was working in London during the 80s. My boss, a stunningly attractive and brilliant lady I won’t name, stood up at the end of a new business meeting with a client. Her skirt fell off revealing her underwear in what only can be described as a Benny Hill moment. She was mortified – the client… delighted. I’m not saying that’s a good way to get clients but I guess in today’s economy all tactics are welcome. When he started, Ogilvy would tell new employees that “ this is a new agency, struggling for its life. For some time we will be overworked and underpaid”. With this approach he was able keep the agency running while trying to attract clients which traditionally only went with the bigger established agencies. In his book, David Ogilvy tells the story of John Orr Young (founder of Y&R) offering this advice to manufacturers in search of an agency: “It is easy to be beguiled by acres of desks, departments, and other big agency appurtenances. What counts is the real motive power of the agency, the creative potency”. Clients want to know the people who will be working on their business. Chemistry is important when selecting a digital agency. It is important for clients to understand who will be managing your account and in particular what their level of experience is. People in the digital marketing business are usually a passionate bunch and anyone a client meets should have that drive mixed with a good dose of common sense. Many clients can be wary after their earlier experiences online. They still remember the dot com days when over-enthusiastic agencies sold them seats on the latest bandwagon. Many clients want vision but wisdom is just as valued. Ogilvy wrote, “There is no excuse for not knowing a client’s business. Use the product or find someone who does. Look at the ads and other marketing materials they have created: theme lines, logos, signs, telemarketing scripts, brochures, videos, catalogs, newsletters, Web sites, direct mail letters, postcards, posters, and even postcard mailers”. A powerful agency asks questions, listens to answers, engages in tireless research, and never stops learning. Don’t try and sell a purely digital campaign to a client if you believe that traditional media would do a better job. Talk about powerful ideas that answer business needs rather than the latest cool techniques. In today’s climate companies are looking for agencies that can affect sales. Ogilvy said “I always showed prospective client the dramatic improvement that followed when Ogilvy took accounts from old agencies – in every case we have blazed new trails, and in every case sales have gone up”. One of the key benefits of online marketing is measurability – tell clients that you will be open and transparent. A smaller agency may not bother pitching for a client when bigger agencies are on the list. Talented people at the helm of small agencies are likely to have more experience than the mid-level staffers that would be assigned to your account at a big firm. Services not offered by the agency can be outsourced, and scale can be bought. It’s the attention and ideas that matter. If you are a small to medium sized organisation chances are you will not be a priority to a large agency – thus will not receive the attention your account deserves. Just because a client operates in a sector in which you have little experience doesn’t mean that you won’t be selected. Cross-pollination of ideas gained from working across a variety of industries can be a real benefit. Every industry is unique, but they all share common characteristics. Often what we learn serving a client in one industry triggers a fresh idea for a client in another. Does the client know what he needs? When you meet your client you should try to find out quickly if he really knows what he wants. If not you’ll be trying to hit a moving target. Are they looking for an agency that can develop strategy or just be an expert at execution? Does he seek company that likes to have fun or one that’s all business? Someone to take orders or someone who will challenge their thinking? It’s hard to be an expert in everything but clients are expecting digital agencies to know more than they do. Key trends in digital marketing are emerging all the time. Ensure that the people in your agency are up to date with the latest trends. Make sure they know how to develop these trends – for example social networking and blogging. This way you can stay one step ahead of your competitors. Make sure you’re engaging with some of the more popular emerging digital media such as Twitter, LinkedIn, widgets, video, mobile, new types of banners etc. Know all about brand platforms underpinned by technology such as Nike+ where technology and utility are used as the backbone in building brands. Digital thinking doesn’t stop at the computer so has your agency embraced mobile, in-store and out-of-home as essential components of digital lifestyle? Agency staff should at least be engaging with the new media and technologies to be able to best advise their clients. Who is blogging in your organization or speaking at events? If you are offering your marketing or design services to a client make sure that your own company shows how to do it right. Does your staff utilize new technologies and media? How does you agency use digital marketing to build your brand, connect with clients and the industry or attract new clients and staff? One final tip from David Ogilvy – Don’t hide the “chinks in your armour”. If you try to claim expertise in an area where you lack the skill you’ll be quickly found out. Better to play on your strengths then find the right partners to fill in the gaps. That way your client gets a tailor-made team for his needs rather than having to make do with the skills you have in-house. Clients want to be wowed with ideas and intelligence. I once tried to win a pitch with a confetti bomb hidden in the room that exploded at a key moment in the presentation. The ceiling came down and we didn’t win. Great thinking doesn’t need explosions. A great agency will blow a client away with smart ideas delivered by passionate & motive team of digital experts. One of the great things about having a kid is the chance to relive your own childhood by making them watch all your favourite childhood movies again. Watching Back to the Future 2 with my daughter from 1985 (OK, I wasn’t a kid then – just acted like one) I was struck by how many of the future predictions have either come true or are way off. They travel to 2014 to make sure Marty’s kids don’t end up in jail. We see flying cars powered by fusion which will not be appearing any time soon… but check out the computerised Nike shoes. We’ve got Nike+ that send running data to your iPod. Marty gets spooked by a 3D shark advertising Jaws 19. Well the Jaws series died a death but the shark looked a lot like Augmented Reality. Later we see old Marty on a video conference with Needles. At the bottom of the screen we can see all of Needle’s personal information scrolling – favourite food, hobbies etc. Social networking? User profiles? The faxes around the house were a bit old school but there was an element of instant messaging in there. Over a dinner of hydrated pizza Marty’s kids are wearing personal entertainment goggles. They even had phones built in. There was definitely an element of the iPhone in there especially when you consider that those goggle devices are now available. Loved the cafe 80’s in the movie. Funny that the 80s revival is already in full swing in music, fashion and more. Now, I’ve just got to get my daughter to watch Tron. Tourism Queensland wins both PR and Direct Grand Prix at Cannes. AdAge reports – When Lord Tim Bell laid out why Tourism Queensland’s “Best Job in the World” campaign had netted the inaugural Grand Prix for the PR category, he sounded almost apologetic.The phrases he used to describe the winner–“classic,” “very simple,” “single-minded campaign”–didn’t signal much in the way of technological innovation or the pushing of boundaries. Instead, his message was that a great publicity idea carried forth in millions of impressions by mainstream media is enough to win, even at a place where everyone is trying to understand new tools of persuasion manned by ordinary consumers. No doubt this campaign will go on to score big in the interactive categories. Read the full report at Creativity Online. I recently came across an interesting article entitled “The First Interactive Ad Man” written by Jeremy Lockhorn, director of emerging media and video innovation at Razorfish. Written in 2004, the article is all about Howard Gossage and shows how his approach to advertising has really interesting parallels with the world of interactive. “He believed advertising should be a conversation. Instead of one-way messaging, get consumers to participate in the ad. If you can, you’ve made a connection. It’s more likely they’ll remember your brand and message”. “He was fond of coupons, sweepstakes, and other gimmicks that got people to engage with his ads. But he also knew how to use a clever headline to grab people and get them involved. This idea, that advertising should be interactive, is now conventional wisdom”. In a later article “Rich Media, Online Ads, and Howard Gossage”, Lockhorn illustrate points about the digital medium referencing the famous adman. Have a read here. He refers to the quote about Advertising seeming like “shooting fish in a barrel”, but says that there is some evidence that the fish don’t hold still as well as they used to, they are developing armor plate. They have control over what type of ammo you have, when the trigger gets pulled, and how fast your shot moves. Oh, and they’re not all in the same barrel anymore”. Gossage said “The real fact of the matter is that nobody reads ads. People read what interests them. Sometimes it’s an ad” and Lockhorn goes on to say that “Online media offer a tremendous opportunity to drive response (conversion, etc.) and to build connections with consumers that will ultimately drive brand forward. Existing and emerging technologies offer power to engage consumers in ways previously impossible. But remember: Nobody reads advertising. People read what interests them”. Find more articles by Jeremy Lockhorn here. If you want to learn more about Gossage then it is worth checking out the 1986 publication The Book Of Gossage put together by Jeff Goodby, Stan Freburg & Jay Conrad. He called Copywriters “very strange people who have only reached copywriting after eliminating every other means of making a living through writing”. He is observations were so well put that it made the industry take a good look at what business it was really in. There is too much of advertising, he complains. “If you have something pertinent to say, you neither have to say it to very many people –only to those who you think will be interested–nor do you have to say it very often. He wrote some quirky ads that reflected his alternative view, especially the one (immortalized in Ogilvy On Advertising) headlined: “SHOULD WE ALSO FLOOD THE SISTINE CHAPEL SO THAT TOURISTS CAN GET NEARER THE CEILING?” for the Sierra Club. This article on the Smashing Magazine website brings together some of the many websites that gather the best elements of good web design. Whether it is simple navigation, audio controls, tabs, layouts etc… you’ll find inspiration on sites such as Pattern Tap, Design Snips and many more. Check out the site now. Thanks to my colleague Michiel for sharing this with me. Two years ago Douglas Rushkoff had an unpleasant encounter outside his Brooklyn home. Taking out the rubbish on Christmas Eve, he was mugged – held at knife-point by an assailant who took his money, his phone and his bank cards. Shaken, he went back indoors and sent an email to his local residents’ group to warn them about what had happened. That, he says, was more shocking than being mugged. He was spurred into action. 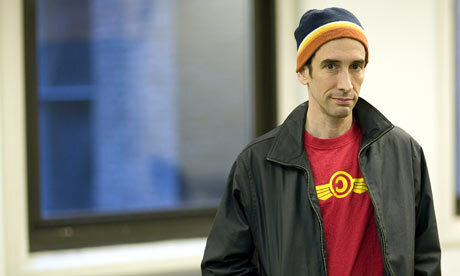 Read the full fascinating interview in the Guardian and find out what inspired Douglas Rushkoff’s latest book Life Inc.
You are currently browsing the Confessions of a Digital Adman blog archives for June, 2009.